The vinyl scene breathes new life in Dallas with the grand opening of art and toy store, ATAMA. 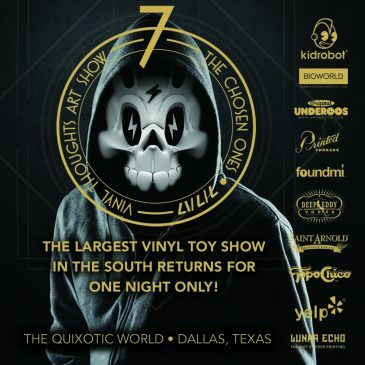 Kidrobot Dallas is closing its doors and are going out with a bang! BURGER AND FRIENDS is pleased to announce its new store, now open in Denton, TX. Frank Kozik stopped by Kidrobot Dallas last night for the release of KidMutant. The signing tour finishes at Kidrobot NY tonight. Frank Kozik was at Kidrobot San Francisco last night for the release of KidMutant. He continues his tour tonight at Kidrobot Dallas. Frank Kozik & Kidrobot 18: KidMutant tour San Francisco, Dallas and NYC March 17-19! Select Kidrobot Tees, Hoodies & Hats 40-70% Off! Check out the Downtown Custom show in Dallas this Saturday, February 20. Dunny Fatale is almost here! Get ready for Dunny Fatale with our comprehensive guide! Mondays in January, show up at any Kidrobot store decked out in a Kidrobot hoodie or shirt and receive 20% off your apparel purchase.